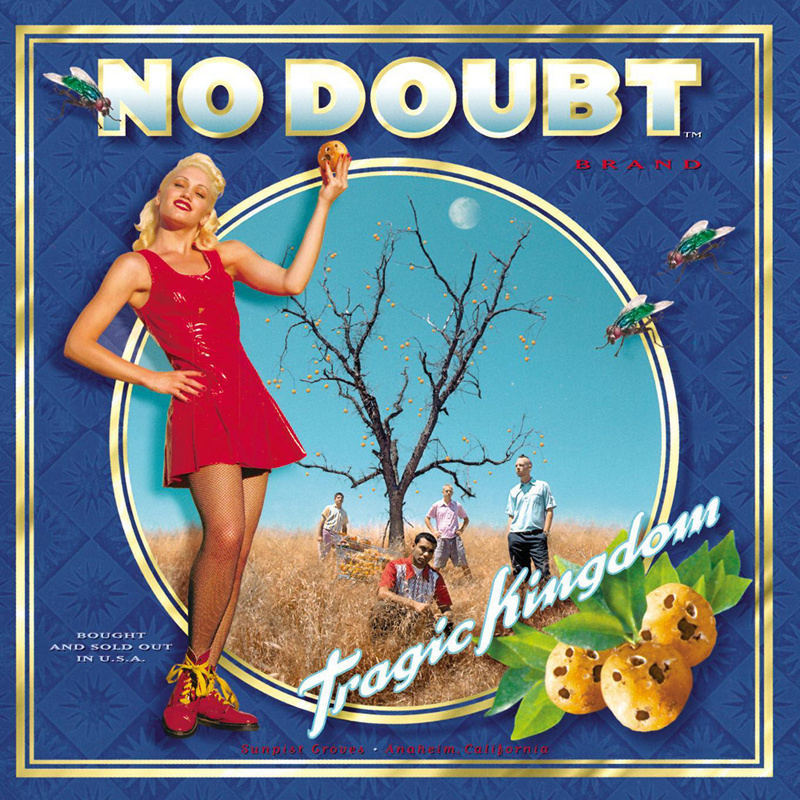 Today’s POP RESCUE is the 1995 album Tragic Kingdom from band No Doubt. This 14 track, 7 single album was a huge hit, however I’m not really a fan of the group or vocalist Gwen Stefani‘s solo career, so this may be a bumpy ride.. The album opens with the gentle percussive roll of second single Spiderwebs. This song has a great pace and bass line but it proved only to be a moderate hit in the UK (reaching #16). Gwen’s vocals feel a little buried here under the music – although it takes on the guise of a quiet Garbage track from 2m 10s for about 30 seconds before returning to roaring guitar. This is followed by fourth single, Excuse Me Mr., which takes the pace up a bit further as rocky guitars lead the song through its 3m 6s. Gwen has some great vocal range here – including a wonderful warble on ‘Excuuuuuse‘. At 1m 35s there’s a comedy little jazz meets Chas n Dave moment, which breaks the song perfectly and at least gives you something different to listen to, if the song’s style is beginning to wear thin (it was). Lead single Just A Girl is up next, and this is a brilliant track. Stefani’s vocals really shine here, and there’s some great guitar work here alongside her. The space that her vocals are given during the verses works perfectly, and helps to keep this song feel like it’s evolving. This song is catchy and up-beat, and unsurprisingly the first single. Up next is Happy Now?, which served as the group’s fifth single. This is quite a nice chugging song – Gwen’s vocals are again making light work of this track. It takes on a slightly lullaby moment at 1m 30s which gives her vocals a wonderful space to showcase her harmony skills, before switching back to her default belting powerful attack stance. Different People is quite bouncy, fun, and almost pop song, complete with some nice little brass stabs that help carry it along. This song is missing the harder growling guitars that the earlier songs have shown, and that’s a relief as it helps break this album up nicely. Sitar opens Hey You, and this song feels a bit 60s musically, reminding me a little of something by The Mamas and The Papas meets The Beatles. It’s nice enough, but not particularly memorable. It served as the 7th and final single, but was only released in The Netherlands. Lucky them. The slow plodding pace of the bassy track The Climb gives Gwen another go at slinky slow numbers, although she again sounds a bit like Shirley Manson from Garbage at times. This song wanders through a jumble sale of styles, occasionally throwing in some Bond Theme, some gospel choir, and a dash of Bohemian Rhapsody, but at 6m 38s, it is far, far, too long and self-indulgent. The pace cranks up for eighth track Sixteen, which as the title suggests is a kind of teenage angst song, with growling guitars, hard drums and Stefani’s scaling vocals. For a moment, the tracks drops into cellos and a vintage clip of what sounds like a psychologist, before returning to the angst. Sunday Morning is up next, and this is quite a nice mellow track, interspersed with a nice guitar riff and backing vocals. This song feels like it wouldn’t have gone astray on Pulp‘s album Different Class from the same year – I could easily imagine swapping Gwen’s for Jarvis’ vocals. This was the 6th single from the album, but it stalled at #50 in the UK singles chart. Next is the huge hit, and third single – Don’t Speak, with it’s beautiful intro of guitar and delicate, simple vocals, breaking into a vocal harmony. This song really is flawless, and was rightly number one in the UK – staying a total of 21 weeks on the chart. The song is catchy, mid-tempo, easily singalong, and not too heavy – complete with a Spanish guitar section. Things take a kind of funky 70s turn with what feels like a disco track in the guise of You Can Do It. A slinky bassline and wah was guitar takes the song effortlessly to the chorus. Some wonderful percussion and backing vocals, with some signature disco strings and handclaps joining in. This feels totally out of place, but it works so well. World Go ‘Round is up next, and this feels quite reggae inspired, with plenty of brass thrown in. It’s quite a nice slow burning song. Piano dominates penultimate track End It On This, and this works perfectly alongside Gwen’s vocals like a show-tune. This is quite a nice song too. Final track, and title track, Tragic Kingdom, opens with what sounds like a safety warning from a rollercoaster. This gives way to Gwen’s powerful vocals set alongside a delicious guitar riff and backing vocals. This is a great song, and a nice way to end… and a slightly fairground one. Bizarrely the song ends on a saxophone solo of part of the Star Wars theme. I hope they paid for that. Over all, this album is all over the shop. At times it is achingly dull – with too many songs feeling like they vary so little that it’s only really the title that differentiates them in my memory. Other songs, like the huge Don’t Speak, the disco You Can Do It, Tragic Kingdom, and End It On This stand out enough to make this album an interesting listen. Interestingly, only one of those was a single – and perhaps why I struggle to have liked them. Where are No Doubt now? No Doubt’s singles career in the UK has been literally hit or miss. Whilst they’ve never topped or matched the success of single Don’t Speak, they came close with a #2 hit in 2002 with Hey Baby. They had a moderate hit on the second release of It’s My Life in 2003, but by this time the rockier sound had faded, and it felt like Gwen Stefani was the group herself. Unsurprisingly, by 2004 she went on to a highly successful solo career, which gave her two albums: Love.Angel.Music.Baby (2004) and The Sweet Escape (2006). The group resumed in 2008, eventually releasing sixth album Push And Shove in 2012, before returning to hiatus in 2013. Mixed reports from band members have suggested an on-off return. 1995 UK CHART POSITION: #3, certified Platinum. Posted in 1990s, No DoubtTagged 1995, album, Don't Speak, Excuse Me Mr, Gwen Stefani, Happy Now?, Hey You!, Just A Girl, review, Spiderwebs, Sunday Morning, Tragic KingdomBookmark the permalink.